There are more than 10,000 kinds of birds around the world, and China has 1371 recorded bird species, of which 76 are unique to China. The fairy-like flight of birds has long enchanted people, and birdwatching is a passion for many. Birdwatching first arose in eighteenth century Britain as merely a pastime for nobles, but it has developed into an outdoor activity that is now popular worldwide. Wandering in nature, listening to the birds and spotting different kinds of birds is the most pleasant pursuit and the most natural enjoyment in the eyes of bird-watchers. Passionate, dedicated, dynamic urban birdwatcher Terry Townshend is a native Englishman whose Chinese name is Tang Rui. Perhaps you think that one needs to go birdwatching in the country, away from the bustle of the city, but in fact, this is not the case. As the environment has gradually improved, many birds have returned to cities, adding vitality to the modern urban landscape. China's capital, Beijing, a city once troubled by severe smog, has at least one passionate, dedicated and energetic bird-watcher. His name is Terry Townshend, a native Englishman whose Chinese name is Tang Rui. Since he came to Beijing in 2010, Terry has sighted and recorded 459 kinds of birds. In his opinion, Beijing is not a place of "thousands of mountains without the sound of a bird's wings" like most people imagine, but a place where "birdsong can be heard everywhere ". Terry has felt attached to birds since he was very young. Because his home was fairly close to the beach and there was a nature reserve nearby, his family's garden always attracted many birds. Twittering around, those birds made the garden lively and triggered a strong interest in little Terry. He made his first bird species identification when he was just four years old. His innate affinity for and continued observation of birds made Terry continue to ask his father and mother questions about these little creatures. When they failed to satisfy Terry's curiosity, his parents bought him a birdwatching book. Since then, Terry has not been able to stop living a wonderful life closely linked to birds and environmental protection, which led him to choose environmental economics as his major at university. So far, he has independently observed and recorded about 2000 kinds of birds, and he can be regarded as a veritable birder. As a bird enthusiast, Terry has his own professional birdwatching equipment. He has a black shoulder bag filled with a telescope, a pair of binoculars, two SLR cameras plus a telephoto lens, plus notebooks and ball point pens in its top pocket. In addition to his bag, Terry also carries a tripod on his shoulder. His small birdwatching notebook records all the details of his excursions, and when he sees birds he can't describe, Terry will sketch their external features alongside his notes. Terry usually starts a day of birdwatching at 4:30 in the morning, so that the sun is just coming up when he arrives at the urban parks or the countryside. Because two or three hours after dawn is the most active period for birds, and because many people are still sleeping at this time, this is the most enjoyable time of day for Terry, when he can commune with birds unhindered. In 2010, Terry came to Beijing to take a job related to environmental regulation at a non-profit organization. Meanwhile, he kept up with his birdwatching in his new home. He started a blog called "Birding Beijing," onto which he uploaded his birdwatching notes. In his blog, Terry patiently updates and collates every detail in Chinese, English, and pinyin. According to his statistics, he has sighted 459 species or subspecies of birds. Every time Terry witnesses one of these species, he marks a small cross in front of the corresponding species name. He also notes each species in his articles, using Chinese characters which even many Chinese are unable to read, like bunting and redstart. In May 2013, Terry spotted an Anthus trivialis (tree pipit) in the garden of a friend. "This kind of bird has been observed only once in eastern China, and no one had seen them in Beijing yet. The bird's only habitat is in Europe, so it's hard to imagine how far it had flown before it arrived in Beijing. It stayed in front of me for just 5 minutes and then flew away!" Those five minutes still make Terry excited after more than a year, and he showed his photos of various precious birds to our journalist proudly. Hard work and good luck have allowed Terry to fortunately observe a kind of bird that had never before been found in Beijing each year. Evidence of Terry's interest in birds jumps out of every corner of his apartment. A quaint Chinese-style bookcase filled with dozens of books about birds stands in the corner of the room. During our interview, no matter whether we were talking in the living room, the bedroom or the kitchen, Terry was able to reach out and pick up an atlas or book to illustrate the birds he just mentioned. A Beijing birdwatching map which Terry created and uploaded to his blog shows birdwatching places, common bird types and even transport information. Because friends are always asking him where to go birdwatching in Beijing, he decided to share and constantly update his special birdwatching knowledge online. Every clear day, Terry will pack up to go birdwatching. He spends a whole day outside in the sunshine, and he spends even more time uploading new birdwatching notes and photos to his "Birding Beijing" blog, which now has around 200 posts. The pieces of information he records in his blog are all basic data in a scientific bird research database that he is building. "There are many young people who look at the latest birding information and use it to arrange a time to go to that place for birdwatching. Every time I come across these people, I am very happy, because it makes me feel like I doing something meaningful." Faced with many difficulties in the birdwatching process, Terry has posted a quote from Nelson Mandela on his blog: "Part of being optimistic is keeping one's head pointed toward the sun, one's feet moving forward." Mandela means that everything has two sides, and there is no absolute good or bad. Once we have made a choice, we have to accept all the possible consequences. Like most people, Terry understands that Beijing is not exactly a "heavenly environment," but there are things about this place that he finds satisfactory, for example, its geographical birdwatching advantage. Each year, a large number of Siberian birds fly through Beijing on their migration routes, and they become guests in this city. "This is a rest stop on their long-distance flight – they stop to take a rest, drink water, look for something to eat, and then travel on to the next place." During his four years in Beijing, Terry has carried out his birdwatching trips at a rapid pace, and he has traveled to almost every urban park and suburban green area here. Wild Duck Lake, Miyun Reservoir, Shidu and Lingshan Mountain are among his favorite places, which Terry praises as "world-class habitats for migratory birds." Speaking about his most rewarding birdwatching experience, Terry was very excited to show us photos of Jankowski's bunting (Emberiza jankowskii), a rare and endangered species which lives only in China's Inner Mongolia Autonomous Region and Jilin Province. It is a brownish bird with dainty body which looks like a sparrow, and because it garners little attention, this species of bird is on the verge of extinction – there are now only 100-150 of them known to be living. These birds prefer to live in the grasslands of Inner Mongolia, and since the grasslands have gradually been disappearing due to overgrazing and agricultural development, nowadays one can only find these birds in a few places. Terry mobilized the Beijing Birdwatching Society and Birdlife International to cooperate with local farmers and government to found the "Saving Emberiza jankowskii Foundation" in 2013. Terry is dedicated to saving endangered birds. One of them is Aythya baeri (Baer's pochard), which lives in Hebei's Hengshui Lake. "This species's habitat is in very poor condition at present. I am trying to cooperate with the Beijing Birdwatching Society and Birdlife International now, and we hope that a bill can be drafted to protect this endangered species," Terry told us. When asked about the differences between foreign and Chinese birdwatching trends, Terry said, "One-sixth of 60 million English people love birdwatching, and more than 1 million participate in bird protection activities. Although China has nearly 1.4 billion people, and over 22 million people live in Beijing, only 300 have joined the birdwatching society. This may be a result of China's relatively low level of economic development, high pressure on people at work and less leisure time, because birdwatching requires plenty of leisure time and expensive equipment." He believes that as China's social and economic level improves and people's wealth increases, after about 20 or 30 years, as in contemporary London, more and more people will participate in this environmental protection army. I like Beijing, it's a place full of surprises and potential. Terry said that he came to Beijing because it was necessary for his job in environmental law. He planned to stay in Beijing for just one year at first, but somehow he has ended up spending four years here so far. "I like Beijing, so for now I want to keep on living and birding in Beijing. There are a lot gaps in the environmental laws here, so I still have a lot of unfinished business here. But I also really love to go birdwatching in Beijing because there are many good spots for it, and Beijing has more birds than London, New York, Paris, Moscow or a lot of other cities." Terry explained his reasons for staying and talked about the future of his work and life in Beijing without hesitation. 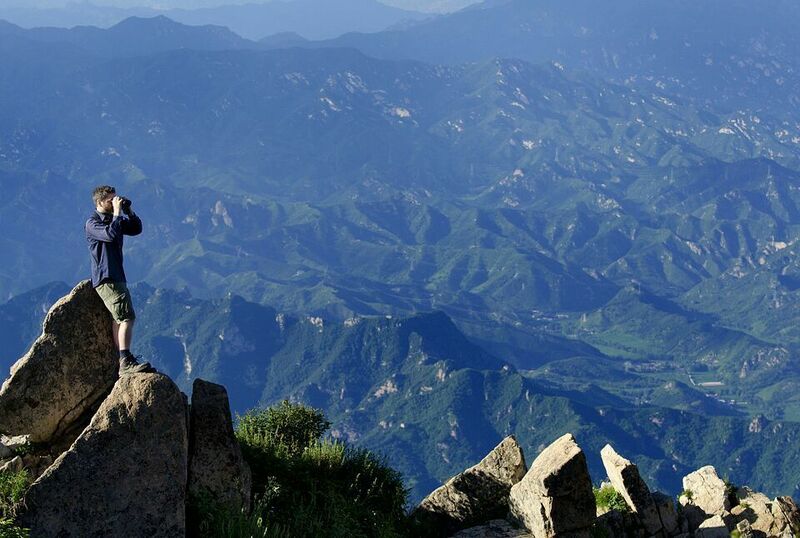 For Terry, birdwatching experiences in Beijing are full of surprises and potential. When it comes to the advantages and disadvantages of birding in Beijing, he thinks that public awareness about environmental protection still needs to be improved. But there is a positive side: many teenagers have started to show a strong interest in birdwatching. As the country's future decision-makers, they are bound to make a difference. Beijing's air pollution also definitely does harm to birds. Next to air pollution, water pollution poses the most direct, profound and deadly threat to birds, and Terry says, "Water protection is more important for a variety of birds that come from far away." As to the phenomenon of hunting and trade in birds, Terry believes that although China has enacted relatively good laws and regulations, it is necessary to truly enforce those laws. China still has a lot of room for improvement in the area of environmental law, and we need to learn from international experience to improve our laws and ensure that the laws are strictly observed. Only in this way can our environment be protected. "Always learning, always discovering." Holding to this conviction, Terry carries his shoulder bag and sleeping bag day after day, wandering around Beijing's Wild Duck Lake, Miyun Reservoir, Shidu and Lingshan Mountain…… He has experienced the brightest and starriest night skies, discovered rare and precious plants and listened to the low cries of owls. Terry started living his fantasy life when he was four years old, and he has traveled from his little back garden at home, through Europe and on to China. For Terry, the best reward of his birdwatching has been his undiminished passion for learning. Each new discovery injects vitality into his life, and he never feels troubled or unknowledgable. Every time he hears a different bird singing, he feel a new rush of excitement. Birdwatching lets Terry slow down his life, relax his body and breathe together with nature. "Beijing is a city with amazing bird diversity, and we can meet all kinds of amazing birds here. The people in Beijing should be proud of this." There are more than 10,000 kinds of birds around the world, and China has 1371 recorded bird species, of which 76 are unique to China.